UNCASVILLE — The transformation is complete. 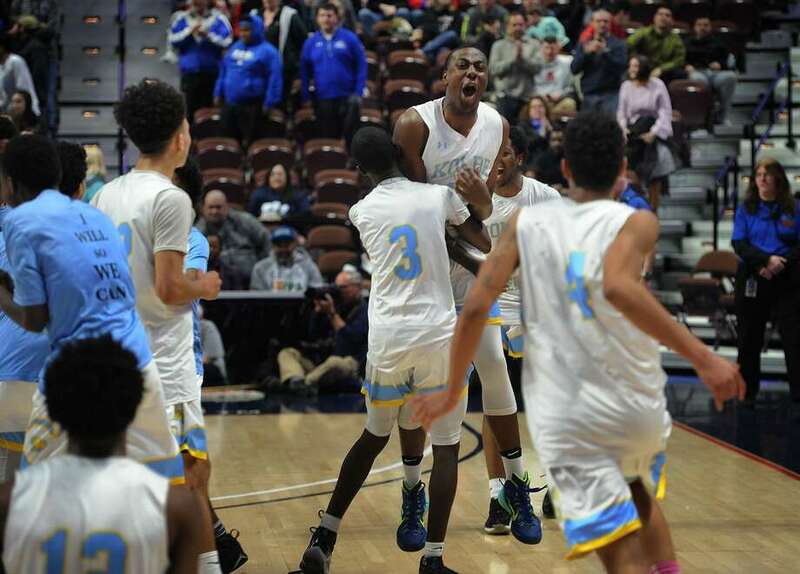 That three-year period that included only eight wins, 52 losses and a whole lot of headaches for everyone associated with Kolbe Cathedral’s boys basketball program is now just a distant memory. The No. 5 Cougars crossed the finish line in their march from worst to first Sunday evening, defeating No. 26 Rocky Hill 55-40 in the Division-IV state final at Mohegan Sun Arena. It’s the first state championship since 2004 and fifth all-time for the Cougars, who climbed their way back from 0-20 in 2015 and 1-19 last season. The remarkable turnaround was orchestrated from the bench by John Pfohl, an eccentric but highly accomplished coach who guided the program to five state finals and two titles before stepping aside in 2008 to spend more time with his family. “You’re 1-19. To come to practice and work and all that stuff, that’s hard to do,” said Pfohl, deflecting the credit to his players. “Now this guy, he’s just a drill sergeant. He doesn’t let up. … My shirt’s not tucked, my shoes aren’t tied. That’s hard to take. Guard Anthony Senior paced the Cougars (21-6) with 18 points. Kyle Federici had 11 points and Sneed added 10 points and eight rebounds. The Cougars did most of their damage on the defensive end, forcing Rocky Hill (12-13) into 22 turnovers. Fourteen of those came in the first half, helping the Cougars built a 23-17 lead. After sneaking into the playoffs at 8-12, the Terriers knocked off four straight higher seeds — No. 7 Plainfield, No. 10 Amistad, No. 2 St. Bernard and No. 3 Wilcox Tech — to reach their first state final since 2002. The Terriers were within three late, 31-28, in the third quarter, but a thunderous two-handed slam by Sneed sent the Cougars on their way to a banner night. Rocky Hill trailed just 35-30 after three quarters, but the Cougars opened things up in the fourth quarter. Their largest lead was 17. Jordan DelMastro led the Terriers with 17 points. Anthony Senior, Kolbe Cathedral, G: The senior scored a game-high 18 points, 16 of which came in the second half. Ryan Robinson 2 1-1 5 William White 3 0-0 7 Riley Donovan 0-0 0 Andrew DiMatteo 3 5-9 11 Jordan DelMastro 6 4-4 17 Christian Castanho 0 0-0 0 Matthew Sevigny 0 0-0 0 Joseph Schiavone 0 0-1 0 Sean Walsh 0 0-0 0 Alessandro Boutin 0 0-0 0. Totals 14 10-15 40. Nazire Vereen 2 2-5 6 Kyle Federici 5 0-0 11 Quinton Sneed 2 6-8 10 Anthony Senior 7 1-1 18 Demetrius Gordon 3 0-2 6 Johnathan Salmon 0 0-0 0 Daniel Wellington 0 0-0 0 Evan Coleman 0 0-0 0 Brandon Gadsden 0 0-1 0 Taeshaun Sanchez 0 0-0 0 Justin Leigh 2 0-0 4 Jason Smith 0 0-0 0. Totals 21 9-17 55. 3-pointers: RH — White, DelMastro; K — Senior 3, Federici. Fouled out: RH — Donovan. Yep, nice, except Kolbe should NEVER have been div4- couple bad years in an otherwise pretty sucessful history. It’s high school, players change quickly, why look at last 3 years? Plus schools of choice (not including vo-ag schools) have advantage. How many div4 schools did Kolbe play during the regular season? Once the AD got rid of Greg Thomas, the program got back to its tradition, playing a competitive schedule, practicing and teaching players. Great win for Kolbe! Great Win!! Pfohl took the exact same roster with one addition (who didn’t play much) and transformed a 1-19 team into a state champion!! Coaching makes a difference. Their freshmen and jv coach must have been stupendous getting all these mediocre players to play at a championship level. (see sarcasm). BTW, how many different towns were represented on its roster?? Except one I believe all are from Bridgeport, but I am not 100% sure. this game could have went either way, why the Rocky Hill coach tried to Run with Kolbe is just one mistake the coach made, the other was chose to play man and not pack it in and make Kolbe win by shooting.